So it has been a week since I “finished” NaNoWriMo. I put finished in quotes because although I hit the 50,000 word count, my actual story is far from finished. I admit I haven’t touched my novel all week. According to my computer, the last time I opened the file was 9:21 PM on November 30. It has been pretty nice taking a good, long break, but I know that soon I need to dive back in there and continue writing. I left my characters in a very unresolved state. Most of the advice I read about doing NaNoWriMo talked about completing your story, even though 50,000 words is shorter than a typical novel. They suggested skipping over or summarizing scenes towards the end if you have to so that you could bring events to a close and type “The End” on November 30. The theory is that it is easier to go back and fill in scenes and details than to keep going with brand new chapters at the end of the story. Well, I didn’t manage to do it that way. I did skip way ahead at one point when I got very frustrated with my progress, so at some point I do need to go back and fill in some events that take place over several months so that there is some sort of transition. But I wasn’t able to jump all the way to the conclusion of the story because I didn’t know how the story was going to end. I guess this is what happens sometimes when you jump in with just vague ideas and characters and no real specific plot. I was discovering much of my story as I went. Towards the last few days, I did finally feel like things were happening and heading in an interesting direction. I remember one evening, just few days before November 30. Renee was getting a haircut and I sat in a little chair waiting for her, jotting down some thoughts and notes in a notebook. I found myself remembering a very long time ago when I flew from Chicago (where I lived at the time) to Sarasota, FL on a business trip. Usually I flew on Delta through Atlanta, but for some reason this particular flight went through Orlando. Now Orlando is not all that far from Sarasota. So I remember thinking that this seemed almost a little bit silly. The plane took off from Orlando, climbed to cruising altitude, and then immediately started to descend into Sarasota. In my memory, that flight was only about 20 minutes from takeoff to landing. It was a long time ago, but that is the way I remember it. I had the same sort of feeling during NaNoWriMo. I got started (takeoff) and floundered about, trying to figure out where to go with my story. I started setting things up and introducing characters and subplots. Then, before I really felt like things were in good shape, all of a sudden I’m running out of time and rapidly approaching the 50,000 mark. Once I hit cruising altitude, it was already time to head back down and wrap things up. I guess the point of all this rambling is that I didn’t really wrap things up. I need to get back to writing and try to finish the story…and then decide if there is enough good stuff in there to be worth revising and rewriting. We spent the week hiking and exploring many canyons in Utah, and I shot a lot of video. I’ve started setting this footage to music to represent each major hike, but I’ve only managed to finish a few of them. Seems like working on videos from the sunny desert in springtime is a great project now that it is cold and gray winter here in Missoula! I also want to get back to more frequent blogging. There are a couple recent house projects Renee worked on that definitely need to be written about! And more pictures of muddy poodles. But I haven’t forgotten my novel or given up on it. In fact, the other day while out walking Darwin I thought of some significant new plot elements that should happen in the story. I may have taken a word-count break, but my novel is still on my mind. I have really been neglecting my blog lately; I have a feeling Ally is going to come after me soon if I don’t post something! I am still mostly on track. So far I’ve written 27,481 words, so only 22,519 to go! I’m mostly on track, although I haven’t done my daily writing allotment yet today (Friday). Its been a long day, so I may just take a break tonight. For the most part, I’ve managed to write just about every day of the month, although on some days I didn’t do very much. I think on my worst day I only did around 400 words. Most other days I came close to or surpassed by goal by a small amount. As for the quality of what I’m writing. Well, there are some parts so far that I like, and I still think there is a worthwhile story in here somewhere, but there are also large patches that I know are going to need to be changed or cut completely when I go back and edit. Now that I’m so far in, I’m finding it a little more difficult to shut off my inner editor and just write. Yesterday was particularly annoying…I’m really not happy with what I wrote at all. I think I am going to try going in a slightly different direction from this point. Fortunately, I’m taking vacation days next week, plus the long weekend for Thanksgiving. So I should have the time to crank out the words and finish by the end of the month! 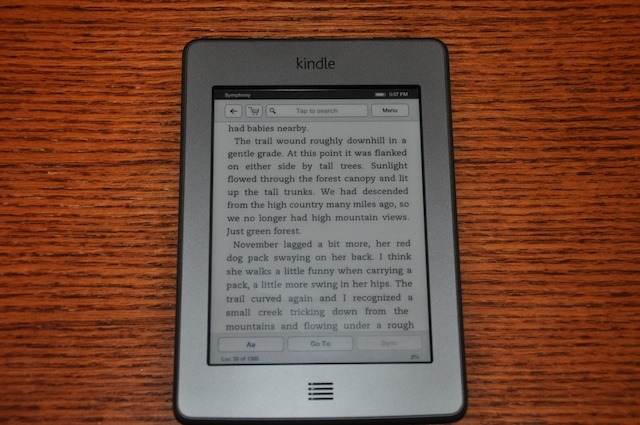 Somewhat related to books, although more about reading them than writing them…a few days ago I got a new Kindle Touch 3G. I went with the pricier version with 3G so that I would still have the option to download books when I’m not connected to a wifi network. This was an upgrade over my old 2nd generation Kindle. The nice thing is, it only cost me $9.99! Okay, that’s not exactly accurate. I had a $100 visa gift card that has been sitting around unused for nearly a year. I also had $30 worth of Best Buy “reward” gift certificates. So I used all that to pay for it and only had to shell out $9.99 of my actual money. So far I like the new Kindle. It is much lighter and sleeker than my old one, and I like the fact that I don’t have to listen to loud button-clicks when turning pages since it is all done via the touch screen. It will definitely be lighter next summer when I take it backpacking. Also, even though I got the 3G model, you can also connect it to a wifi network when available, which seems to transfer books more quickly. My old one did not have that option. I find it kind of cool to see this. I’ve also tested out reformatting it as a paperback novel and it comes out to about 107 pages. Somehow the words look different when presented as an actual book. Of course, being busy with NaNoWriMo means I haven’t really had time to read much with the new Kindle. I read a few pages of a book I started before November and one short story. That’s about it so far. I am really behind on posts about recent house projects. A few weeks ago, Renee took out these big ugly sliding door in the shed (it was really just a piece of plywood pretending to be a door), reframed the opening, and installed a nice, real door and window. It looks great! I have a bunch of pictures to the process that I need to organize and write about. Then she’s been working to help Carolyn and Ally redo their living room / dining room with new lighting, a new half-wall room divider with columns, new insulation in the attic, and paint. It turned into a pretty big project (all starting from just one new light fixture). It isn’t quite finished, but I think they are pretty happy with it so far. The plan is to work on painting tomorrow. I think this whole thing will be done in time for Thanksgiving dinner! Again, I’ve got plenty of pictures – I just need to find the time to get them organized and write a post! Just a real quick update this morning before work. I’m two days in to NaNoWriMo and so far things are going pretty well. On day one, I wrote during my lunch break and then again in the evening. I hit 2474 words, which is more than the daily quota of about 1667. So this felt like a good start. When I actually started writing, I ended up taking my first couple scenes in different directions from what I had originally planned (not that I had really planned much; I really wasn’t sure how to start the story until I sat down and started writing), and I introduced a few characters that I hadn’t really anticipated before. I’m not positive, but these characters may lead to a subplot (or play a role in the main plot). I was really afraid that when I started, I’d run out of ideas in the first ten minutes, so I’m thrilled that my brain seems to be generating new ideas on the fly, right as I type. Yesterday was a little more difficult. I took dogs on a walk during lunch time, so that used up that time (Myka and Darwin liked being a higher priority though). I had to do most of my writing in the evening, after we came home from the Day of the Dead parade. So I didn’t really have time to start writing for real until about 8:30. Then I somehow got hung up writing a scene in an airport (again, not something I had planned before). I haven’t actually flown in a few years, so my airport memories are a bit hazy. No idea if this scene is any good or not. I didn’t go much over my quota this time, but I did at least meet it with 1658 words. And my character is still sitting on an airplane, so I’ll have to finish up that today. On another note, I’m very happy that so far it has worked to write on my laptop in the living room. I spend all day in my home office for work, so the last thing I want to do during non-work time is sit in there for a few more hours. Besides, Renee and all the dogs are in the living room, and I like being near them. I’ve discovered that with a pair of noise-canceling headphones and some music I completely block out the TV and can focus on the writing. The first day I went with some older heavy metal music (Iced Earth). Last night it was Flogging Molly. It seems like fast music works the best for me so far. That’s about it. I’m not sure what time I’ll write today — probably after dinner. Hopefully I’ll keep discovering new characters and story lines as I go! This November. I am going to attempt to do National Novel Writing Month (more commonly known as NaNoWriMo). For those of you who have never heard of this, this is a challenge to write a 50,000 word novel during the 30 days of November. Does that sound sufficiently crazy? I have never tried this before, but has been going on now since 1999. Check out their Web site for lots of details. I’m a technical writer, so it just makes sense to present some FAQs about me, my yet-to-be-written novel, and NaNoWriMo. Have I written a novel before? Have I at least written fiction before? Yes, although not for a very long time. I wrote some short stories in college, but not much afterward. The whole point behind NaNoWriMo is to shut that off, give yourself permission to write crap, and just churn out words. If you write a bunch of crap, well, that’s better than just sitting around writing nothing because you’re so worried about writing crap that you’re completely paralyzed. I have no idea if this churn-out-the-words approach will work for me, but I think it is worth a try. The other idea behind NaNoWriMo is that giving you a deadline can help you set aside all the excuses and just write. I’m good with deadlines; I work within deadlines all the time in my professional life, so I’m thinking this extra motivation will help me get moving. Because I’m 40 years old and I’ve wanted to write a novel since sometime around age 10. I can come up with a million reasons why now is not a good time. I’ve been doing that forever. Writing a novel was always a “well, someday I’ll get around to that” kind of thing. And I don’t want it to be a “someday I’ll get around to that” kind of thing anymore. How will I find the time for this? Good question. I’m not positive on that point yet. 50,000 words divided by 30 days comes to about 1666 words a day. I’m hoping that I will be able to average more words on some days to make up for bad days. 2000-2500 words a day would be a good goal. I’m thinking this might cut into my TV and reading time. So far I’ve done a little brainstorming and thinking about what my novel will be about. I also read part of No Plot, No Problem, which was written by Chris Baty, one of the people who originally came up with NaNoWriMo. Right now, I have a very vague plan in mind. I have a character, but I don’t know her name. She has a particular special “ability” (for lack of a better word). This has caused her a great deal of trouble in her life and she is trying to find a way to change or get rid of this ability. I know a little bit more than that, but that’s all I want to say so far. Do I have a plot in mind? Have I created an outline? I have only a vague sense of the plot. I’ve thought of a few events that I think will need to take place at some point in the story. I’m hoping that the pressure of a deadline and the need to write 50,000 words in 30 days will help me materialize a plot out of nothing. Will I post excerpts as I’m working on it? Probably not. I think that would probably turn that Inner Editor back on, because I’d want to revise a bit to make it “presentable” first. I don’t think I’ll really have time for revisions if I’m going to finish in time. But who knows. If a section comes out absolutely brilliant, maybe I will post it. You never know. Will I at least post about my progress? Yes! At least, I’m planning on it so far. At the very least I’ll probably post my word count as I progress through the week. Has anyone ever written anything decent as part of NaNoWriMo? Yes! There is a long list of published novels that were written as part as NaNoWriMo. I personally haven’t read any of these so I have no idea if they are any good or not. But I have heard good things about Water for Elephants by Sara Gruen (didn’t they make a movie of that one?). Also, The Night Circus by Erin Morgenstern is currently on the New York Times bestseller list. Do I have high hopes for doing something great? Not really. I just want to finish. I’m trying to regard it as novel-writing practice. If I end up with a manuscript I can revise into something worthwhile, that’s great. If it ends up as utter dreck, well, it was just practice and hopefully I had fun along the way, so its all good. If I start imagining that this is going to turn into a bestseller, I have a bad feeling that the Inner Editor will show up again and I’ll stress out about whether or not I’m writing anything worthwhile. So I’m just not going to go there. Honestly, I have no idea. But I’m really hoping that it will be fun! Short answer: sometimes a Facebook status just isn’t enough. I need more words to blather on! Longer answer: I’ve been meaning to get back to blogging now for a long time. I actually did have a blog several years ago. I started it in 2004 and sort of tapered off on posting in 2006. I never had much of a readership, but I did like having a place to express all my thoughts on many different topics. I wrote about my life, my pets, politics, gay and lesbian issues, and other random stuff. I moved from Illinois to Montana during the time I was blogging, so I wrote all sorts of posts about that too. I got busy with all sorts of other things and stopped posting very often. Although I COULD go back and continue with that same blog, it seems sort of silly. I’d rather just start fresh. My old posts are probably full of spam comments by now. Plus, “Muddy Poodles” is a MUCH better blog name than my old blog. I never really did like the name I picked for the old one…it was very boring. Once I had the name Muddy Poodles in my head, I needed a use for it. Hence, a blog! Finally, I’ve also been meaning to get back to doing more types of writing beyond the technical writing I do for a living. A blog seems like a good way to do that (and a good way to motivate myself to write more often). I don’t expect that I’ll have very many readers, and I’m really not going to worry about that. This is all just for me to have fun.